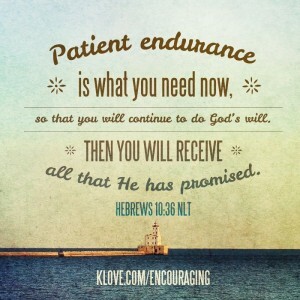 Patient Endurance – For the Love! 2015 was a challenging year for our little family, and deep down I think we knew it would be—we just didn’t know all the reasons why. So when I was challenged to come up with a guiding word or phrase for 2016, I really wanted to pick something like “joy,” but after prayerful consideration God led me to “patient endurance.” Sigh. I hope that instead of another challenging year that means we’re being prepared for whatever God has called our family to do next. Looking back I think last year was that too. It’s really all about perspective. Physical: Establish a weekly routine that allows time for rest individually and as a family, exercise and abide time with God. Emotional: Pray fervently whenever I experience negative emotions, so I better train myself to go to God first and not fall into the trap of believing the devil’s lies. Spiritual: Pray before interacting with others, so I can better reflect God’s character and offer grace even when it’s hard. Last Sunday our Pastor Aaron Lytle just happened to preach about patient endurance. I took that as confirmation that God really does want our family to focus on patient endurance in 2016. If you’re interested, you can watch Pastor Aaron’s sermon on patient endurance below. So here’s to a year of patient endurance and all the lessons it may bring! God, thank you for loving me enough to break into my life. Please continue the good work that You started in me and my husband and transform our hearts to seek satisfaction in God first, so our love and joy overflows from that relationship into our marriage and into the interactions of all those we encounter. May God’s Kingdom break through in me, change the way I perceive the world around me because I find joy in Your approval and not that of others. In Your name I pray, amen. Pingback: Giving Up Negativity for Lent – For the Love! Pingback: Goodbye 2016, Hello 2017 – For the Love!